For me, this is the fundamental purpose of fairy tales. I’m talking about old fairy tales, here, like Ashputtle, the Grimm Brothers’ version of Cinderella, where the step-sisters carve up their feet to get them in that shoe, and it is only the blood dripping from their foot that gives them away to the prince. Fairy tales like Brier Rose (Sleeping Beauty), in which dozens of young men die in the brambles around the enchanted castle trying to reach the sleeping princess. Fairy tales like Blue Beard, where a young wife discovers the blood-soaked room where her husband has murdered his previous wives and barely escapes from him herself. The old tales are dark-edged, blood-filled stories, with doorless towers, secret chambers, and murky forests. Parents abandon their children to starve. Wolves and witches devour children. Husbands kill and eat their wives. The death and horror that is in them can be terrifying, but the message is powerful and clear. Evil exists, but evil can be overcome. We need this message today. Recently on Facebook, Anne Lamott posted about the frustrating and inane things people say when they are trying to comfort others. The most helpful thing she heard came from a radio preacher who suggested we stop looking at the mountain in front of us as an obstacle. Instead, we should “Talk to the mountain. Say, I will defeat you,” and then we should do just that. But defeating mountains and slaying dragons takes more than courage, determination, and persistence. It also takes belief. We have to believe that it can be done. 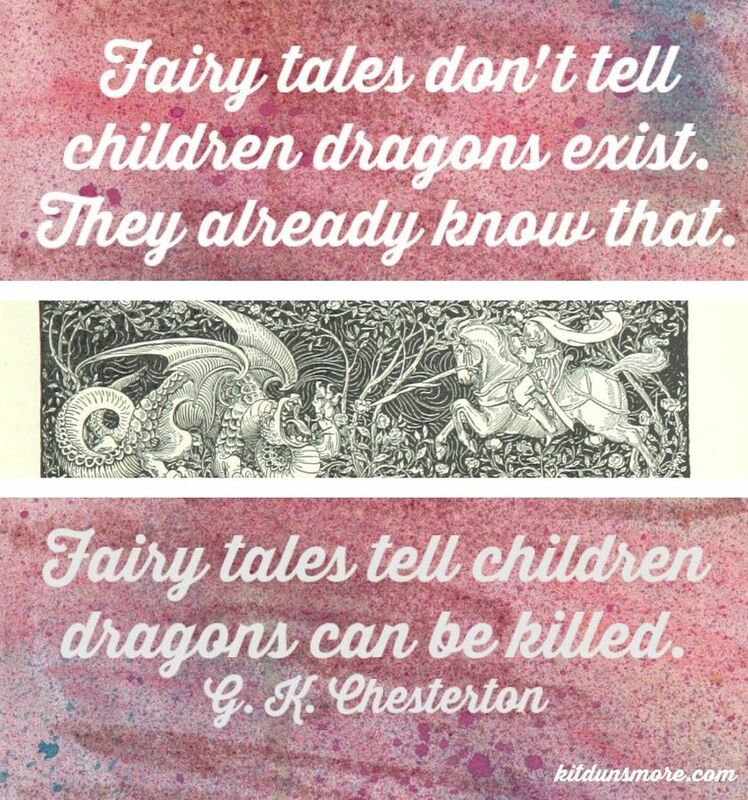 Note to my fellow dragon-lovers: I hesitated to use this quote. The modern idea of the dragon is that of a wizard — something intelligent and cunning, dangerous but not necessarily evil — rather than an insatiable damsel-eating monster. Ever since I read Anne McCaffrey’s dragonrider books, I’ve been just like Hagrid — wanting a dragon of my own. To talk of killing dragons makes me balk. I had to remind myself (as I remind you), that Chesterton isn’t thinking of Toothless when he says “dragon”. He’s thinking of Smaug, Smaug at his horrible, greedy, murderous worst. I tend to think this concept is why so many teens go through a horror movie phase. It helps them believe they can fight and overcome evil – at least temporarily. Like you, the Dragonriders of Pern filled me with a burning desire for a dragon of my own. Toothless has only cemented that desire. You make a good point about the teen attraction to horror. I have a low violence threshold, but as a teen, I was drawn to darker writers like Poe and Lovecraft. I think Toothless is probably the perfect pet dragon, although it would be even cooler if he could talk.